I did a series on Blogging for Profit a few years ago, but as things have changed a lot since then (and I’ve also learned new tricks and tips! ), I wanted to re-post the series with updated information. This series will run each Wednesday for the next two months. Enjoy! The short answer is: it’s easier and harder than you may think. It’s easy because it requires very little cash outlay upfront, you don’t need a degree or certification, the field is wide open and the profit margins are high. On the other hand, setting up a successful blog that makes a part-time or full-time income will only be the result of massive amounts of effort, determination, consistency and perseverance. Anyone can be a successful blogger, but unless you’re already a celebrity, there’s no such thing as overnight blogging success. It takes hard work, sweat and more hard work. It may be a few months before you ever see a penny from your hours of labor invested into your blog. If you don’t think you could write three posts per week for the next two years on your chosen blog topic, you need to choose a different topic or a different work-at-home idea. It’s great to learn from others, but if you want to be spoon-fed, you won’t succeed. Roll up your sleeves, start digging and researching: read books on blogging, read articles on blogging, read blogs on blogging, watch bloggers who are successfully blogging and do your own experimentation. In a market that is already saturated, fresh and unique voices and approaches are those that will stand head and shoulders above the rest. How are you going to be different from all the other bloggers in your niche? Readers come back when they can count on you having regularly-updated content. It’s much better to post three times per week every week, than to post thirty times one week every few months. Next week, I’ll share how to set up a blog and produce content that readers are going to want to flock to. In the mean time, do you have any specific burning questions you’d like for me to cover in this series? Drop me an email or leave them as a comment. I can’t promise to know the answer or have space to cover it, but I’ll definitely try to address as many of your questions as possible. are you going to tell us how much bloggers earn? to see if it’s worth it. a blogger will only earn as much as she/he will put into it. it’s NOT overnight. you are looking at a 2yr commitment like it says above, and if you are money hungry, people smell that 10clicks away. The easiest way to turn off potential readers is to make them think you are there for the cash! Many bloggers do decide it is important to make an income blogging — but every single one who has has never done it at the expense of their readers! That depends on tons of factors. No one starts out making money -but in time, with hard work and good content, you can earn lots of money. There really is no limit – six figures a year is definitely possible. Depends on your success. The better you are the more sponsors/advertisers you get. It’s not a salaried job. At first, most bloggers are in it for nothings and then as your success grows, you get the sponsors. Your earnings will depend upon many different factors, but, as a rule of thumb, you should try to be making minimum wage per hour worked within six months of blogging and then slowly work up from there to making $10 to $15 per hour invested in your blog. If your blog continues to grow, you may even be able to work up to $20 to $30+ per hour. This is great advice — but also hard to follow! So many bloggers (me included) spend so much time blogging because we LOVE it — so in the first year I know many bloggers who have never turned a minimum wage…only to find themselves in great income shape a year later! Rarely do you get hard numbers on what bloggers earn- I hope that changes some in the future so we can make sure we are getting compensated fairly from advertisers.. but until then here is a post you may find interesting.. Sorry, typo. She asks others bloggers to tell in the comments how much they make (not me personally). Thank you for this. I am still learning, but realize mistake I am already making. I look forward to learning more. Looking forward to reading your series. I’ve been reading your blog since Spring 2008! I love your blog site design and layout. It appears that you have an independent Website that is setup like the standard blogs from blogspot or wordpress. Whatever it is, it looks great and navigates easily. It is also fresh too. I am interested in this series of posts regarding blogging. I have been off and on trying to blog for about three years now and was posting consistently once a week on Sundays. Can you be a successful blogger posting only once a week or do you have to do it more frequently? The other question I would have is to help me understand whether there is any value in having my site RSS Feed enabled and helping me understand exactly the benefit of using it (or even what it is). I’ve been wondering about any “rules” – giving credit where credit is due, linking to other blogs, etc. My family and friends really want me to start a blog to tell them about all of the deals I get, and although I do save money on my own, I hear about many of the deals I get by reading a variety of other blogs (yours being my #1). Are there any regulations out there? And if there aren’t any officially, what is the right, the moral, way to do things? Thanks, Crystal! If you find a deal on someone elses blog or they email the deal to you, you need to link back to their page and give them credit for finding the deal. If you see the deal reposted by another blogger, make sure you click the original bloggers link and give them the credit for finding the deal, don’t just give the credit to the blog you found the deal on. I hope that helps! I too have just started a blog and was wondering about this! So if I like the CVS shopping list that is posted on this site, I can copy and paste it on mine and then type “Thanks, December212012” and make her blog name the link to her page? My friend and I who are writing the blog want to do a “my shopping list” and then a link to the total deals for the store so this would be awesome if we could do that! I agree with Whitney – make sure that you the blogger first. A lot of hard work goes into the match up lists. Hours of work, and often other bloggers just take the content without any kind of permission. A small one sentence type of “deal” is a different story, but content or match ups, one really needs permission. In general — you never want to copy and paste ANY text from another blog unless they have given you permission. If you get a “deal” from another blog, rewrite it in your own words and then say “thanks” with a link to the blog you got it from! Great comment. Maybe me chuckle!!! Just for that, I am checking out your blog. Best of luck! I started a blog, basically because I would just email all my friends and relatives to tell them what deals where out there for NH, since I don’t know of any blogs just for NH stores. But, I don’t publish, anything, I do not find by myself, this way I know it’s me. But, obviously everyone picks up the same deals. I coupon ethically, and I do awesome, so I don’t have any patience for those who don’t follow the rules. What is your blog Laurie? I live in NH and am always looking for deals! I couldn’t agree more with your 5 points! Passion and interest are key, as is patience. Creativity is also paramount. My niche (laundry) is incredibly dull if you don’t add a unique spin to it. It is a constant on my bloggy to-do list to come up with creative, innovative ideas for my readers. Jen, you’re very kind. 😉 Thank you! My blog is not as popular at MSM, so I can’t speak for the amount of income she makes. But in my opinion it’s what you make of it. I don’t spend as much time blogging as more popular blogs and my content is more random than one specific topic. But that’s how I like it. So obviously I don’t earn as much as some bloggers. I started out blogging just for fun. It was my hobby and I didn’t even care if people read my posts. It gave me something to do while the kids napped and it relaxed me. Now that my blog has become a more popular in the past few months, I have started earning an income from it. I can’t pay our mortgage with the income, but the little bit I do receive is nice. I am so glad I started my blog. And whether or not I have a bunch of followers or if I earn an income doing it, I still love doing it! Great series 🙂 I look forward to hearing your tips! You are definitely right about having to be a marathoner, blogging is definitely more work than it seems. I couldn’t agree more with your 5 points! Passionately blogging about your interest is key, as well as patience. I can’t wait to read the rest of your series! I’ve blogged for years, but recently I started a new niche blog. I was at relevant and heard you speak about scheduling time with blogging which is definitely my weakness. I know to “grow” your blog you need to spend time visiting other bloggers, commenting, networking ect. However, that is my struggle…I get sucked in to doing that and then never write! When I focus on writing I don’t have time for the other stuff and then my blog doesn’t grow. I was just curious how much time you would recommend devoting to each…although at this point I’m sure you don’t have to spend much time visiting others blogs. I’m really excited about this series! I want to know more specifics on affiliates and how exactly you make money with them. Are there certain places to put your affiliate links? There’s still a lot to be learned from you older series, but these are great Quick Tips! There is a lot of behind the scenes hard work that goes into running a successful (even semi-successful 😉 ) blog. It’s rarely an “overnight” business. You have to be a good writer also! Absolutely! But I believe you can *become* a good writer, with practice and persistence. Creativity, motivation and passion will go a long way in improving writing — as will plain exercising of your writing skills. I think you should write on this topic (writing better). There’s something that saddens me when I hear someone say they want to start a blog and the first question is: “how can I make money?” One of the keys to growing as a successful blogger (and yes, making money) is to learn to write well. While everyone can learn and improve, I don’t often see folks chatting about how they can improve content or sharpen their grammar. Instead, seems the conversations are new affiliate programs and growing Facebook numbers. 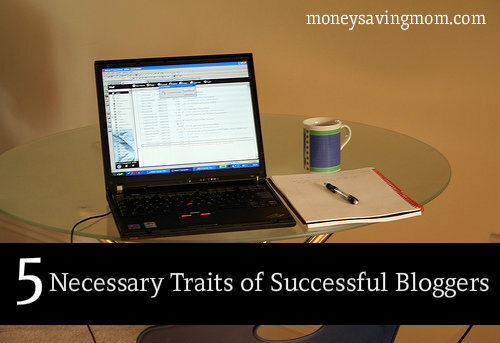 I’m definitely going to be covering this topic as I believe it is very vital to being a successful blogger. I think it is so important to constantly be pushing ourselves to improve, learn and grow. Awesome. I’m excited for your series! I have been toying with idea for the last year about hiring someone to design my blog to replace my blogspot template. Do you have any advice on what to look for in a website designer and what is reasonable to ask, or how to find a good deal on website design. I really feel that has to be a big part of this, if your site is not user friendly who wants to visit even if you are writing and posting great content. I write my post in Windows Live Writer (because I have a PC) – do you have any tips on software or applications that can make posting and editing easier? I have thought about switching my Google Blogger blog to WordPress, but I have decided against it. I am so familiar with Blogger and it meets all my current needs, that I don’t see how it would be worth it. There is an option on Blogger to pay $10 a year for a unique domain name (WITHOUT the .blogspot.com tag at the end), which I think is totally worth it! Plus, I don’t have to pay for monthly hosting, which is a huge blessing. I used rvblogdesigns.com. Rachel is a friend of mine from high school and she did an excellent job. Most of all, they are EXTREMELY reasonable! Hope this helps! A website designer will charge around $10K for a good website. (This seems ridiculous, but good design costs money.) For a cheaper method, I would a local college to see if a graphic design/web designer might do it for a good price. Please offer more than $100 though for a designer though. As a regular blog reader, I couldn’t agree more that site design is SO important. I’ve really stopped reading some blogs because the design bothers me or it’s hard to navigate. It also can give it a really professional feel instead of it just looking like a personal blog. I don’t have great ideas for really cheap but high quality blog designs. You do not need to spend $10,000 for a great blog design. There is a pretty big discrepancy between the cost of of really good website and a really good blog (to the bloggers advantage). My question is, how do you know ahead of time what deals will be at the stores and what coupons are coming out in the paper. Some sites have next weeks deals up already. How is that possible? How do you get a coupon database? My sister and I started a local site because we hated finding a great deal online and we get to our store and it wouldn’t be there. All I can say is this is hard work. Before, I would just post a note on my personal page letting everyone know the deals I found. Now I feel like all I do is sit at the computer typing. I am a beginner with a passion, but still learning this whole blogging thing! I have a passion and things to say, but what is the best way to start a blog and make it successful and produce income. I would love to hear your take on how you did it (yours is one of the first blogs I have read consistently!). I have heard some ideas from others but they do not seem realistic. You cover so many topics on your blog; it’s so helpful! I hope I can get my blog to be successful one day. I’m only 19 now, so maybe by the time I’m in the “Mommy Bloggers” age, it’ll be big! I am wondering if there is a way you can tell if your content is good! ?! Good writing, good layout/navigation and consistently helpful content is all great. I also appreciate clear perspective…I guess you might also call that a niche. MSM is pretty great, and there are a few others that I consistently learn something from. In a blogosphere that is rampant with frugal/coupon/mom blogs, differentiating yourself from the noise seems to be the challenge. Hi Crystal, glad to see you’re talking on this topic, and I’ll be curious to follow you. :: How do you handle it when another blogger copies your work or idea without credit or reference? :: How do you handle it when you feel another blogger has somehow rained on your parade? :: How do you handle it when after months your traffic has only grown slightly and you’ve made little to no money? :: How do you handle the “his” and “lows” of blogging without losing your mind? :: How do you handle it when another blogger decides to start a blog in your same area, on the same topic? :: How do you handle it when a reader leaves a particularly hurtful comment on your blog? :: How do you handle it when drama unfolds on your Facebook wall and multiple readers react negatively? I respect you as a blogger and know you must deal with some of these things on a much bigger scale. I would love for you to share how you handle the emotional aspects of blogging. these are all great questions! i’d love to know your answers Crystal! Nope; I think some of these struggles are typical to blogging. However, they aren’t often talked about. The emotional aspects involved to starting a blogging business REALLY threw me. Which specific issues do you mean, angela? Great questions, Angela! This too is what I’m most curious about. Great questions, Angela. Hopefully we’ll get some answer to these in following weeks. Great post, thanks for sharing! Looking forward to reading more. Your blog has been an inspiration. LOVE blogging! I like your point about “Marathoners, Not Sprinters”. I think bloggers in many ways are like entrepreneurs, “self starters” who have the “creativity” and “passion” to carry the vision of their blog. On a recent trip I had the privilege of talking with several of my blog readers. It was an encouraging and rewarding to hear their generous feedback while meeting people from across the nation who were reading my blog. One tip that has been a tremendous help to me is to keep a notebook or computer program handy at all times to write down blog article ideas. It is a great resource for when I want to pick a new topic to write about. Having it written down in my blog notebook allows me to think about new topics of interest when I have free time or to have a few days, weeks or months to decide how I want to implement a new idea. As a blogger I know there a many more tips I need to learn and that it is important to always be improving my skills. Thankfully we have wonderful resources and top notch bloggers with amazing talent to help us fine tune our blogs. I am wodering more about the accounting business end when you start earning money. When is the right time to maybe setup an LLC? Or is there a way to register your blog name, so no one else can use the same name? I am far from needing to do either of these yet. Just curious about all the legal stuff and accounting & tax issues. Thank you for the tips! I’m looking forward to reading the posts to come! Kasey, I like your blog name! Cute! This post reaffirms what I have been realizing in the past month: I am just not a blogger. I love to write, I love blogs, but I am not a blogger. I wanted to be, but I have to recognize that I simply do not have the stuff. Numbers 1 and 5 on your list do not describe me; I took on NaNoWriMo (National Novel Writing Month, a challenge to write a 50,000 word story in November), which was a terrific “sprint” rather than a marathon. But I am finishing the edits of the story I began there and plan to self-publish my biblical fiction novel in the coming months. Thanks for this post; it’s oddly comforting to read that I’m not these things I wanted to be…but I’ve found what I am–a novelist. This is a great point, Michelle. I started blogging because I wanted to write, and thought that it would be something for now, until I could “really” write. I have been surprised at how much I love blogging for what it is. Instant feedback, real relationships with your readers, community building. Once I embraced that it was about so much more than writing, it has been much more rewarding. Great to see you updating this information on your original course. I really think that #1 and #2 are the biggest points. Just like any business, there is no true “Make $10,000 in 1 month” at home jobs. They just won’t happen. Blogging is truly a niche that needs to be looked at as a marathon, and not a sprint. One thing I might add – and might get some slack from – but if anyone is only in this to make money – then they need to find something else. Your content and passion needs to shine through. Through that you will gain people trust and network with others. And FINALLY through that, you will find the money. But that passion needs to bleed through in your content. And you’ve done that here. Thank you for your inspiration and being an example of someone to follow and learn from. 1. I’m curious if it is possible to build a successful blog by using blogspot. I may need to use blogspot (or a similar one) since the .com domain names I want have been taken. Does blogspot look less official/desirable to readers? 2. I am concerned about privacy and the internet. I RELUCTANTLY got a account a year ago, I rarely put pictures on it, I also rarely use my true name and dob when entering drawings, freebies etc. The fact that a normal person’s information is so readily available on the internet is scary to me. So to have a blog would be a HUGE breach of the security barriers I typically set up. I know that to have a successful blog people need to feel like they know the blogger well. But to do that, I would have to sacrifice my privacy preferences. What do people who share my concerns do about that? I would attempt to find a unique domain name WITHOUT the .blogspot.com. It is much easier for readers to get to that way. You could try .net, .org, etc. About privacy, I never disclose my last name or my city/state. Since I have tons of pictures of my kids on my blog, privacy is one of my utmost priorities. I also started a Facebook page for my blog with my blog name, not my own name. There is a way to keep your identity private and still connect with your readers. It just requires being transparent and genuine! Readers need to know you aren’t perfect…who wants to read the blog of someone who thinks they have it all together??? Just a word of caution about using Blogger. If you are making any money you can not afford to lose you should not be using Blogger as your host. You do not own your site, Blogger does, and they have the right to remove it anytime they please. I, too, was very comfortable with Blogger and had no desire to move to wordpress.. until they deemed one of my sites spam (because it was making money). It was a “deal site”- geared toward deals and freebies for kids. I came in one night with an email from Google saying, “we decided you site was spam, we removed it”. And that was it- I tried to have them review it and reinstate it, but no luck. Around that time the same thing happened to a few other big name deal bloggers. They seemed to be targeting us. It took me a month to get the site back up (on WordPress) and by that time any momentum I had for site growth was gone, it was a newer site. I went ahead and moved my main site to WordPress and although I miss the ease of Blogger I do not regret that now I own my site. So, unless your site is personal and only making a tiny income (from Google ads or something) you should be on a self hosted WordPress site. I adore this website! Happy I have a fellow Kansan to look up to. I am thrilled you decided to do this series!! You are a rolemodel Crystal! *How to handle the accounting & taxes? I have no idea how to keep track of expenses and income, and how to file this on taxes. I don’t want to get to tax time next year and find out I did it all wrong. Do I need to form a business or just do it on my personal taxes? *When soliciting advertising (mine would be from local relevant businesses), how much to charge for ad space on my site? I don’t even have a rough idea of how much to charge, especially when first starting. Do I offer a free first month just so I can get the ads up? If you make over $600 with your blog a year you need to get a business license. I track my income on a spreadsheet in Excel- partially for taxes and partially just so I know what I am making each month. If you make over $600 with a company per year they will send you the proper paperwork for your taxes. Just a note about the business license: The need for a business license is determined by the town/city in which you live – not county, state, etc. I need a business license, but literally 5 miles down the road a blogger does not. So call your town/city to determine if one is needed. They aren’t horribly expensive. I believe mine was $25 for the year. thanks for the clarification- I guess it boils down to that you need to check with your city!! I am so exciting with this topic cause I want to learn more how to blog . thank you so much for taking the time to cover this subject, I look forward to learning from you. As I always learn, and amazed at your talent. 1) how to request a free product from supplier for review. what is the process? 2) how to get sponsorship for my blog?? I have started blogging so inspired by your website Crystal…You have the right mind set about it and that gave me courage to start my own celebrating the ethnicity that I am. Thanks for posting this series it sure is going to help. Thank you, thank you, thank you!!! I have been blogging now for 6 months and your site is really the only guidance I’ve had on setting up my blog! I am sooo super excited to read this series! Thanks for all you do! You’re great! Yeah! Great topic. I just finished up the design on my blog and I am ready to move forward to learning how to increase traffic and earn some money. Can’t wait to see what you have in store! 1. What are some of the best ways for bloggers to work together to help gain greater exposure? 2. I started a giveaway and don’t know the best way to attract other bloggers to go to the site to post. I have terrific stats for a blog that has only been around for less than six months and a strong following. Any suggestions? 3. Is affiliate links the only way to make money, what other creative ways can bloggers gain income? Thanks and looking forward to your responses. #1 Approach some bloggers you like and start a blogging group. You can do giveaways together, cross post and advertise each other in your sidebars. Plus you can have a safe environment to talk about ideas with each other. Affiliate links are a great way to make money. You can also sell a product, course or ebook on a topic you are an expert on. I’m not at all interested in doing affiliate links and I am aware about selling products etc. I was hoping to see if anyone had any new creative ways to make money. Thanks for the tip on the blogging group. you could also work with advertisers.. but you will find the money minimal unless you have a lot of traffic. It will be one of the best things you can do to propel your blogging success! The thing that scares me about blogging is my lack of computer knowledge. How much did you know starting out and how much have you learned along the way? 1. How much time do you put into running your blog? I’m sure this varies wildly depending on what type of blog it is, how often you post, etc., etc., but it seems like a successful blog like yours would be more than a full-time job. 2. What does your weekly or monthly blog schedule/to-do/activities looks like? 3. How do you set boundaries / balance blogging, family, friends, etc.? 4. What safety/security tips do you have in terms of sharing personal information? I’ve noticed some bloggers will almost tell you exactly where they live/work/go to church, while others are more vague. I’m sure this will be a great series! Read Crystal’s Time Management series. She works about 25 hours per week and has employees that work for her now too. Looking forward to this topic. Honestly at this point I’m not looking to make any money (maybe in the future 🙂 but I do get a real kick out of seeing all different countries that my readers come from. It’s pretty crazy that we can write something and within minutes it’s being read around the world! Thanks for your insight. It seems like the majority of respondents are wanting to do a blog about saving money. At some point you have to ask, how many money saving blogs does the world need? It’s important to find something either unique or at a minimum, a unique spin on a subject that is already well covered. I am looking forward to your series. I have been blogging for close to 6 years now. It started out as a way to express my thoughts, but I would love to make it a part time or full time give. 1. What are some ways to get more visitors? 2. How do you get regular visitors to start participating more in discussions? 3. My blog focuses on a bunch of topics mostly related to my life (adoption, single parenthood, dating, raising boys, biracial kids, behavior problems, etc…) Should I be focused on one niche topic? Should I start another blog that’s not so personal? #1 make sure your blog/posts are SEO Optimized. This way you can start picking up more “organic search” visitors. You may want to check out they have a decent free 30day course on making more money with your blog that talks about specific easy SEO steps you can do. I think if you are getting a new computer most anything will serve you well for blogging. Just make sure you have a fast internet connection so you are not wasting your time. This is a great series. I am in the early stages of starting a blog myself. I absolutely love your blog and view it often. I don’t think I will have one niche but will cover a few topics: steals and deals, cooking, and family life. I would say my biggest challange is trying to grow my blog. How do I build up traffic? Can you discuss how you use social media: , Facebook, etc. I’m soo excited! Thanks again for this series. It’s right on time! can you talk about giveaways?? I have a personal blog, but I’d like to do a giveaway. Thanks!! I am so unbelievably excited that you are doing this series again! I have been following Amy’s steps () for about a month now, and am coming to the end of her instructions. So it is perfect timing for me to read this new series! I like all the suggestions above, and look forward to learning from the best! This site has much advice on successful blogging. How does one get started in blogging? I am interested but don’t know were to start. If you HAVE to take a break from it what do you do?!?! I have an idea for a second blog, but don’t know if there is a need? (My first doesn’t really get all that much traffic because there are so many others like it.) Where could I test that out and see if it is worth working on? Could you cover the topics of respectively declining an offer – the proper how to’s & I’m starting to receive requests for advertising and sponsorship and I have absolutely know idea how to walk through that mine field successfully. Great series – I’m really looking forward to it. I’ve toyed with the idea of starting a deal blog with a little bit of a unique spin, but finally decided it just wouldn’t work for me. I work full time with a long commute and just do not have the time to devote to it. However, I still enjoy reading the information about blogging and storing the information away for the perhaps the future. Also, I have a personal weight loss blog that I currently have no plans to monetize (it’s just an outlet for me), but I still would like to improve it for fun even if I’m not making money with it. I’ve always wondered how a deal blogger could possibly have original content? If you see a deal on another blog, is it okay to post on your site (without directly cutting and pasting) as long as you give them credit or do you also need their permission (especially for those hot deals that are practically on every deal blog)? Also, I notice many deals on forums before they are on blogs. Is it okay to use those deals? Also, how do you deal with the fact that you have to put in countless hours of work before you see a penny and you’re not guaranteed to see that first penny? Seems like that would be an emotional challenge. I’d also LOVE to see guest posts from newer bloggers or bloggers with different perspectives and approaches (somewhat like you did in the managing your time series). Just found your blog today,looks great. My question is how long does it take to get readers when you start a new blog. what’s the best way to get set up? free like blogspot or independent .com that you pay for? if you have to pay for your site, what are the advantages? What I Learned Teaching Sunday school was a place to keep all the SS lessons I wrote, thoughts from great Christian books, quotes, thoughts on really good sermons, etc. was my first one written as I was setting up my online print on demand store. I only really use AdSense on these and my own store products and cookbook, but I love all of them, enjoy writing them and they each serve a purpose. Looking forward to this series. I started a blog last fall to share recipes mostly with friends, but then discovered MSM and found out that I could possibly make money from blogging. I don’t think I have enough traffic yet for that, but when do you know if you have enough traffic for monetizing? I’ve wanted to blog since before I even knew you could make money at it–I love writing and interacting with people. I just haven’t started because I have so many varied interests that I don’t have any idea what I should write about. I’m interested in technology, language/linguistics, fashion, frugality… I guess my question is twofold: 1) how do I settle on one thing? and 2) how do I make my blog stand out from all the other blogs on whatever topic I choose?